This page lists all the websites and physical locations where to buy stamps from. All these vendors have a USPS license which authorizes them to sell USPS postage meters that are currently in use. If you don’t want to wait in lines or look for USPS-licensed vendors in your area, you can purchase stamps online. To see how much postage stamps cost, check out current postage stamps rates offered by USPS for both domestic and international postage. 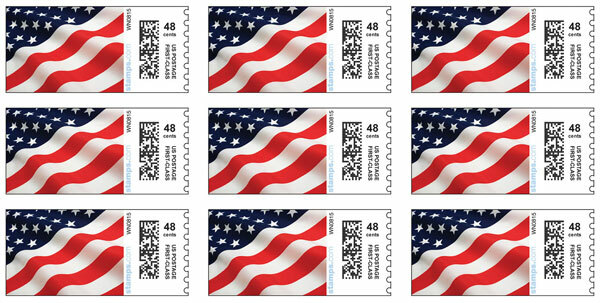 You can purchase stamps from the USPS online store. Shipment is usually quite fast – you receive your order in a day or so. However, during the holiday season, you can wait as long as a week for your postage stamps and mail supplies to arrive, so make sure you plan ahead before you order. Stamps.com is an online authorized postage stamp vendor which allows you to print your own stamps at home. You don’t have to wait or pay for shipment and you can print them directly on the envelope, postcard, or a plain piece of paper for storage. At the moment of writing, stamps.com also offered $5 free postage for the first 4 weeks to new members. Amazon.com is another reliable choice when it comes to buying stamps online. You may need to do a little bit of research, as stamps can cost more than they would at the post office. You’ll also need to factor in shipment costs and the time it takes for your order to arrive. Nevertheless, if you click on the link we provide below, you will only get offers from USPS, not other sellers. eBay is yet another place where you can buy stamps online. From old, used stamps for collectors to new stamps you can use today, you have plenty of options to choose from. If you don’t want to purchase your stamps from independent sellers, you’ll be happy to know USPS uses the platform for selling their stamps too. If you are interested in specific stamps such as wedding postage stamps, first class postage stamps, or customized postage stamps, we have separate sections that could provide more information for those particular cases. Here are the main vendors that are authorized to sell postage stamps in their stores. You can also see a list of your local USPS-authorized vendors on the official USPS office locator. The most obvious choice when buying postage stamps is the USPS office. Their locations are sprinkled all over the US, so there’s definitely one near you. However, if you don’t have time, you may want to consider an alternative as there are often very long lines here. Certain US Postal Service offices have self-service kiosks where you can buy stamps. You can use the USPS office locator to find the offices where you can find these kiosks. Nevertheless, since they are located within the office itself, they may be quite crowded as well. You can find postage stamps and other supplies in most office supply stores. Most sell individual stamps, rolls, and booklets of 20-100 stamps. The following banks offer stamp sheets through some of their ATMs, but may apply additional service fees. Some gas stations sell postage stamps booklets of 20 or more stamps at the register or through a postage vending system. This is especially valid in remote areas that are far away from a USPS office or other physical locations where stamps are available. These pharmacy chains with stores all over the United States sell stamps, usually in bulk. As you can see, there are plenty of online and offline stores you can purchase stamps from; in fact, it’s nearly impossible not to have at least one of these places nearby. Do you know other reliable websites or physical locations that sell stamps and were not mentioned in this article? If so, let us know in the comment section and we’ll add them to this page.